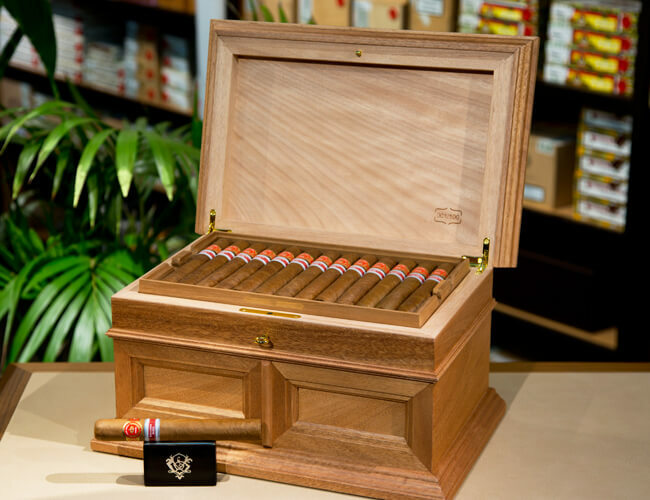 The humidors are manufactured by the artist Ernesto Aguilera in his Humidores Havana Studio at the request of Intertabak, the official importer of Habanos for the Swiss market. Juan López Eminentes, the Swiss Regional 2016 was put on the market in boxes of 10 by the end of the year 2016 and we had to wait until May 2018 for humidors. It is an elegant and massive cigar called Sublime (54 x 164mm). This size was previously used for the Cohiba in 2004 and Montecristo in 2008. The Eminentes is exclusively made with selected leaves from the Vuelta Abajo, Pinar del Rio. The humidor is equipped with an Adorini 2nd generation Cigar Heaven electronic humidification system with a multi-country electric plug.